Following his participation in Captain America: Civil War, Scott Lang (Paul Rudd) is under house arrest and attempting to juggle his newfound superhero responsibilities with his responsibilities as a father to his young daughter, Cassie (Abby Ryder Fortson). Although she supports his crime-fighting lifestyle, Lang can’t help but feel he’s messing up his new role at every chance he gets. 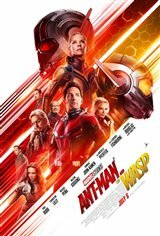 While he’s grappling with his two very different lives, Lang is approached by Hope van Dyne (Evangeline Lilly) and Dr. Hank Pym (Michael Douglas), who have a new mission for him. A stealthy criminal named Ghost (Hannah John-Kamen) has gained the ability to phase through objects using stolen Pym technology and threatens to take over the world. Once again, Lang must don the Ant-Man suit. This time, he finds a crime-fighting partner in Hope who has a suit of her own and dubs herself The Wasp.